The MHOR04 is a well-established, high-speed protection relay for feeders. This high-speed protection for feeders is based on the Merz-Price circulating current system. It is suitable for the majority of plain feeders and provides a single-phase current for comparison over a pilot circuit. MHOR04, which features a unit protection scheme with no time or current grading problems, even on ring circuits, can be used to protect the majority of plain feeders. The three line currents are united to provide a single-phase current for comparison over a pilot circuit. 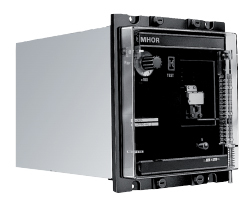 MHOR04 operates at high speed, providing a through fault stability that is 50 times greater than the relay rating. With four output contacts, MHOR04 pilot circuits number up to 1000O 2.5µF.